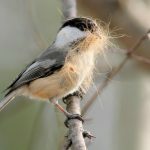 While there are many birds who are able to build their nests in trees, shrubs, and planters there are other birds that need natural cavities for nesting. Woodpeckers for example, drill holes in decaying trees for their nesting places and owls use abandoned holes for theirs. 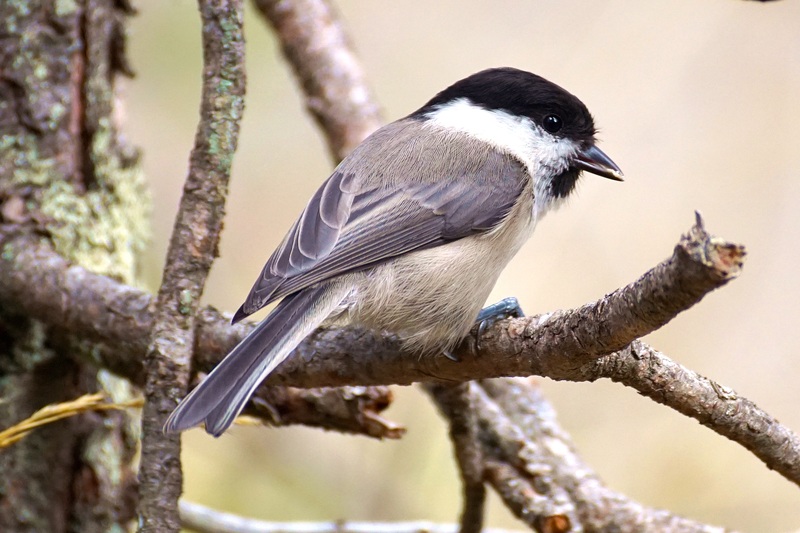 With increased land development and removal of damaged and dead trees, there are not as many trees left for cavity-nesting birds to raise their young. Additionally, the invasive birds like the starlings and the house sparrows, compete with the native bird species such as the wrens and bluebirds for the use of the remaining cavities. 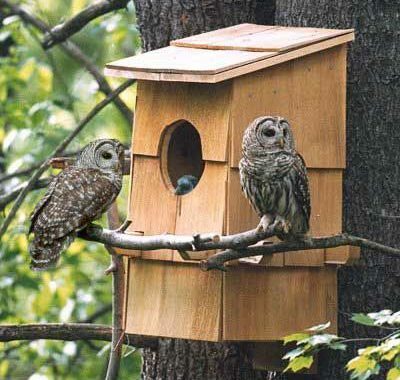 So adding a nesting box to your backyard habitat will benefit the native bird species. Plus it will provide you with plenty of opportunity to enjoy watching the male and females carry nesting materials back and forth as they build their nests, and later watching as the young start to fledge those nests. #1 It should be made of natural untreated pine, cedar, or fir. #3 The entrance hole should be the appropriate size to allow the desired bird to enter and keep the larger birds out. #4 The entrance should be the correct distance from the floor to accommodate the nest. #5 It should have an extended sloped roof to keep the rain out. #6 It should have a recessed floor with drainage holes to keep the inside dry. #7 The interior walls should be rough or grooved to help the fleglings exit the box. #8 There should be ventilation holes to allow the inside to stay cool. #9 There should be a side or top panel that you can open so that you can monitor and keep the box cleaned for the next brood. #10 There should be no outside perches which will allow predators or other nuisance birds to get near it. Different birds require different size holes. For example the House Wren and Carolina Wren need a 4 x 4 inch to a 4 x 6 inch base and should be 8 inches high. The hole should be 1-1/8 ” centered and the box should be placed five to ten feet high on a post or hanging in a tree. The bluebird on the other hand needs a 5 1/2 x 5 1/2 inch x 10 inch high box with a hole that is 1 1/2 inches and centered on the box. 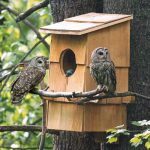 There are many do it yourself plans out there if you wish to make your own nesting box. Just be sure you get the correct size for the bird you want to attract. You can also purchase one at your local bird supply store. 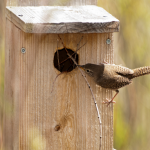 Or you can go to NestWatch at the Cornell Lab or Ornithology, type in the region where you live and the habitat of your area, and it will give you nesting box sizes of the birds in your area. If you are trying to get a specific bird to your yard you also need to have the right habitat for it. Bluebirds for example, feed their young insects, and need a grassy, open field. Their houses are most acceptable facing an open field preferring an east direction but will use a north and south direction too. Wrens on the other hand generally like boxes that are well hidden, hanging from trees, and have also been know to nest inside of hanging flower baskets. They eat tiny insects but will also feed on meal worms, suet, and sunflower seeds. So wrens are going to be pretty common for most people to get. Screech Owls are very common in backyards too believe it or not, it is just that they are nocturnal so you may not see them. They like birdhouses mounted on the trunk of a tree in a woodland of mature trees and will use them for nesting in the spring and roosting in the winter months. 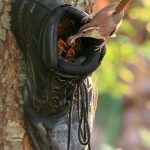 Some birds will nest just about anywhere even in old shoes as seen in the photo where a wren has taken over. Also, if you are not looking to attract any specific species and just want to get any bird to use your bird house or whatever it is, then you can place it just about anywhere you want in your yard. There is no guarantee that a bird will use it right away, but eventually some bird will find it and make it their new home. You should set up your bird box before brooding season. In the southern part of the country this would be no later than February. In the northern part you should set them up by mid to late March. You can place the boxes out earlier if you want as this will give birds a chance to find and use your box and may even want it for winter cover when it’s cold outside. Once the breeding season starts and birds are laying eggs , watch for fledglings. You will want to keep track of them so that when the birds are no longer using the box you can remove the nesting debris. It is not a big deal but some birds will not use the box if it has an abandoned nest in it. Plus, you may even enjoy two or three more broods for the season. You Will Love To Watch Your Feathered Friends! I truly enjoy watching the mama and papa birds transporting nesting materials to the bird boxes strategically placed in my yard. It is very entertaining watching them fly back and forth carrying grass, dog hair, or even string in their beaks. It is a constant activity to see as the birds fly in and out of the box. Then about two weeks later you start to hear and see the young learning to fly around the yard. It’s a great thing to see! 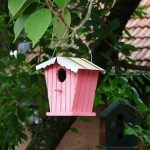 Do you have a unique nesting box that you use? Please leave your comments below. ← Peanuts! Peanuts! Get your Peanuts!